When Eragon first sees the object lying on the ground in the wood he thinks it is just a beautiful, clearly very special, stone. It is only some time later that he discovers that the stone is not a valuable gem that he can seel so that he can buy supplies. The stone cracks, breaks open and Eragon realizes that what he has found is in fact an egg. A little dragon, wobbles its way out of the remains of the egg and it instantly bonds with Eragon. The little creature soon begins to talk to the boy using some sort of mental telepathy. Though he fears the consequences of his actions, Eragon takes on the responsibility of rearing the dragon whom he names Saphira. It is not long before some "strangers" visit his home, destroying almost everything that matters him. With his uncle dead and the farm where he grew up a ruin, Eragon vows to avenge the wrongs done to him and he sets off in pursuit of the Razac, creatures who have pitiless and black hearts. 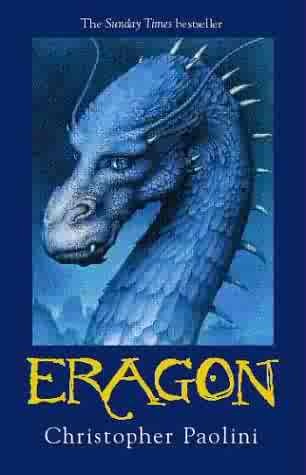 Eragon begins his travels accompanied by, Brom, the mysterious old story teller who seems to know a great deal about dragons, the Dragon Riders of old, and the empire. Brom is also able to fight like a warrior and he can manipulate magic. The old man sets about teaching Eragon his skills as they travel in the wake of the deadly Razac. Eragon begins to realize that some great destiny lies ahead of him. He has no idea which side of the conflict, which seems to be threatening the land, he is going to support. He does not dare to believe that he might be the first of a new generation of Dragon Riders. Christopher has created a complex and fascinating world in this first book of his Eragon trilogy. As the relationship between Eragon and his dragon grows and flowers into something powerful and magical, Eragon tries to understand who and what he is. He needs to know what his role is in the power-struggle that threatens to tear his homeland apart. This superbly crafted story is filled with history, ancient tales, magic, magical creatures, and it is sure to delight many readers who enjoy fantasy tales.